Can I trek the Annapurna Circuit on my own? The Annapurna Circuit, like the Everest Base Camp trek and the Annapurna Sanctuary, is a classic trekking route with well-trodden paths, ample tea house accommodation and plentiful company in fellow trekkers. 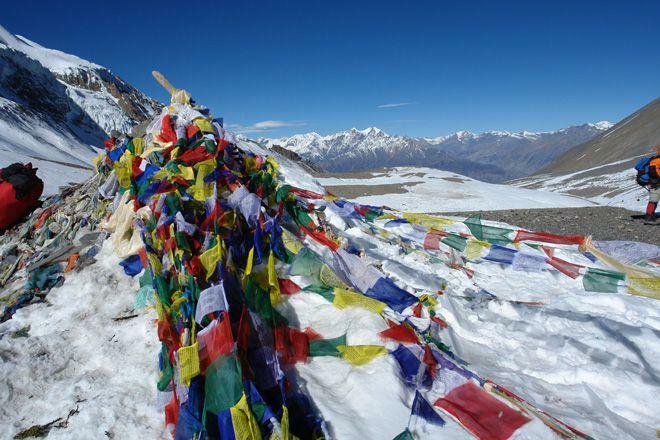 Despite this, the Annapurna Circuit is a challenging three-week trek that goes to high altitude and makes considerable demands on the body. It’s certainly possible to tackle the Circuit as an independent trekker but you should be aware of the issues involved and you may find that an organised group trek is a more straightforward proposition. If you are thinking of backpacking on your own around the Circuit, the fact that there are lots of tea houses en route means that you don’t need to carry camping gear or food supplies. This will undoubtedly lighten your load considerably and will allow you to set your own schedule and take rest stops and rest days whenever you need. You will also have the company of fellow trekkers every evening and have time to get to know some of the local people that you meet on the way. However, given the weight of carrying a pack coupled with the physical demands of trekking at altitude, a good alternative to travelling totally alone is to hire a local guide and/or porter. This will mean you only need to carry a daypack, you will get a local perspective and have someone to rely on in the event of accident or illness – perhaps the most important point of all. Guides and porters can be hired via trekking agencies of which there are an abundance in Kathmandu or Pokhara. There are therefore plenty of positives to trekking independently but also a few downsides. If you are determined to trek without any support you are particularly vulnerable to being ill or having an accident in places where getting help can be difficult and costly. Altitude sickness in particular is a real danger if you have no one keeping an eye on you. And, although hiring a guide isn’t difficult, you may find it difficult to ensure that you have a good one – the process can be a bit hit and miss – especially in the busy trekking months when many guides will already be employed on the Annapurna Circuit and other routes. You need to negotiate their wages, your itinerary and what’s included in the costs and you will also have to carry quantities of cash to pay for your food and tips. All of these issues add extra stress and require a certain amount of pre-planning before you leave to lessen their impact. The other option, and undoubtedly the most stress-free, is to travel with a UK based trekking company. Of course, we are biased on this point, but we do believe that a good tour operator should remove all the logistical difficulties for you. On our Annapurna Circuit trek for instance you travel to Nepal in the comforting knowledge that everything has been organised in advance: Your tour costs covers all your accommodation, flights, transfers and meals on treks – so no need to carry large amounts of cash; you will have a trek guide and support crew who are vastly experienced and have a wealth of local knowledge; you will have your detailed itinerary in hand so you know exactly what to expect and have peace of mind that it has been planned to maximise acclimatisation; tea houses will have been booked in advance so no concerns over whether accommodation will be available at the end of a long day on the trail; and you will be provided with a sleeping bag, bed tea in the morning, extra snacks and as many hot showers as you want thereby providing a few extra touches of comfort to enhance your trekking experience. And, if you do fall ill or have an accident, then you know you’re in safe hands and there will be a contingency in place to take care of you and ensure you get the medical attention you need in the quickest possible time. The decision on whether to backpack, to hire a guide or to book with a tour operator is entirely down to the individual but, if this is your first time on the Annapurna Circuit or trekking elsewhere in Nepal, we would highly recommend you book in advance with a reputable and experienced tour operator so that you only have to focus on enjoying the incredible experience of trekking in the stunning Himalaya.